- Respect for the WF rules and Administrators. - Respect for you opponents and teammates. - A commitment towards participation for all involved, including welcoming and helping new members. We ask that every participant takes the time to read and understand the rules, and to use the Chain of Command for any issues relating to WF8. All members of WF8 are expected to conduct themselves with maturity and decorum. Be it on the forums or in game. Differences of opinion are to be discussed in a calm, factual manner on the forums. Insults and name-calling, accusations of ‘cheating’, ‘swearing’, etc, will not be tolerated. If you have an issue, bring the matter up through your Chain of Command for review and resolution. Failure to adhere to this code of conduct, at the discretion of the event organizers, can bring suspensions and/or expulsion from the WF8 event. 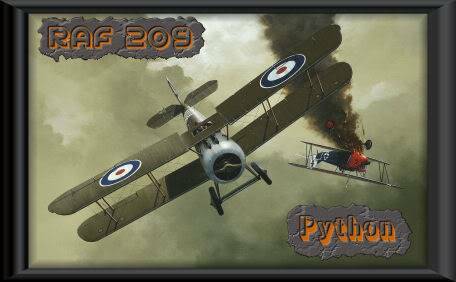 WF8 takes advantage of the Rb2serveM02 developed by Kpijon to allow for simultaneous bombing. WF8 also employs the use of RBSMons a server side program used to decode player data packets, it is very helpful in tracking many rule violations, and it was also made by Kpijon. Scoring of WF8 games is done with the use of Chevelle’s RB2score Utility and manual corrections. War Forces VIII is an eight ( week online “War” set up for the enjoyment of the Red Baron 3D online community. It is played using the stock NFM. The war is progressive through the different maps and planes available in the game (see chart). Both teams bomb target simultaneously. Individual squads or squad alliances can join either “force” the Central or Allied. At least two games per week will be played. The number of players per game could be as high as 40 total. Team sizes are to (2O) per side. The schedule is dependent on the number of teams registered. Each match will be 2 hours and 30 minutes long. A match begins when the server appears in the list of servers at the appropriate start time and ends when the server shuts down. The match server will go up and shut down automatically with the normal time remaining warnings being given prior to server shutdown. Pilots and their planes still in the match or in flight when the match server shuts down are not lost for scoring purposes, nor do pilots have to land or exit before the match ends. Destroying enemy ground targets and killing enemy aircraft score points. The force with the highest total points at the end of the 8 weeks wins the war. Teams cannot exceed the maximum number of allowed players in the game arena. A penalty of –2 points per minute and/or partial minute will be issued. Players cannot use Observer mode, If a player is logged using observer mode his team will forfeit the match and all points from it as well. Each team will start the match with four active dromes with a maximum of six players at each drome. These active dromes must be reported by the TR or designated representative at the conclusion of the match in the topic area designated “Drome Reporting.” Not reporting incurs a 10 point penalty. Players must use their assigned active aerodrome they entered the game at until that aerodrome is destroyed. Exception: RBSMons allows for a “grace period” at the start of the match where players can change aerodromes. The grace period will be the 1st 5 minutes of the match. Players must relocate to a new aerodrome when their current active aerodrome is destroyed. • If you are in the air when you discover the aerodrome appears destroyed but you are unsure if you should move or not, when you are ready to, land your plane. If it does not repair, inform you aerodrome mates that the base is dead and relocate to a new one. If you have respawned or entered the game and have doubts to the status of the base DO NOT take off, exit the game to the gold room, and wait until one of your aerodrome mates can land and see if the drome will repair. An eligible relocation drome must be the closest non-destroyed drome in any large grid sector immediately adjoining the sector where the destroyed drome is located that is not been previously declared an active drome. If there are no such dromes then the nearest drome will be used. The six pilot rule per drome still applies. When a player dies, crashes, flames, nets out, or legally exits the match the pilot must relocate and re-enter or respawn at the new active aerodrome. Players cannot fly from a destroyed aerodrome. Flying from a destroyed aerodrome will void any kills and targets destroyed by the player(s). Aircraft classified as a bomber can bomb, rocket or machine ground targets to include enemy aircraft on the ground. Machine guns only is to be used on airborne enemy planes. Aircraft classified as a fighter/scout cannot bomb or rocket either ground or airborne targets. Fighters/Scouts can machine gun ground and airborne bombers, scouts/fighters only. Fighter/Scouts cannot destroy ground targets. No points will be awarded for will be awarded for Scout destroyed ground targets. In addition a Scout who is logged destroying a target will be investigated for bomb and rocket use. A –5 point penalty will be issued for each bomb and rocket used by the scout through the entire game. Fighters cannot use bombs or rockets. If a fighter is witnessed using bombs or rockets and the logs support the witnesses claim a –5 point penalty will be issued for each bomb or rocket used by the player through the entire game. Players cannot crash their plane into enemy targets. No points will be awarded for targets destroyed if the player crashes into it. No matter if the target destroyed message is logged before or after the crash. Players cannot crash planes into friendly targets. Full point value for the target will be awarded to the other team for any target logged as being destroyed by a friendly aircraft. Players cannot ride flamers. If a pilot fails to re-life restart after 9 seconds, a -15 point penalty will be assessed, and an additional -15 points will be added for each 3-second interval thereafter per each occurrence. Players cannot exit the game while in flight. A penalty of –5 points will be issued any time a player is logged exiting in flight. No penalty for exiting in the last 10 seconds of the game unless there is enemy contact. Players can only exit the game from the aerodrome they entered the game or after a death. Exiting any other way the player will be issued a –5 points penalty. Communications – Voice Communications such as Team Speak, Roger Wilco Ventrillo, as well as written chat are permitted during the game. Teams must be registered to fly in the event. Teams will register in the forum labled “ Team Registration” The following information must be provided: The name of the team, what side (Allied or Central) the team wishes to fly on and the name of the players who will comprise the team and the name of the Team Representative and alternate. Independent pilots are welcomed to fly in the event. They may register in the Team Registration under the topic “Independent Pilot” Registration. They will provide their name and side they desire to fly on. The pilots will then be allocated to below strength teams by the SFM via random number generator. A squad may invite any independent pilot to join them for War Forces VIII. The independent pilot can only accept 1 invitation and fly only for that 1 squad for the duration of the event. The pilot must be registered with the team on the forum. Independent pilots will wear prefix of the squad he/she is a guest of during War Force matches. War Forces will consider the guest pilot a member of the squad he is flying with. In the event the host team is an alliance one of the alliance squads must take responsibility for the independent pilot(s) and the independent pilot must wear that squad’s prefix during the match. When all teams have been registered by the forum posted close date, the SFM will construct the schedule and request match availability dates from the participating teams and then post the final schedule in the forum topic area designated as “Schedule.” The schedule will include a re-fly week. Should a match need to be re-flown due to server issues or teams wishing to reschedule a match the team will fly that match during the re-fly week which will be the week after scheduled meet play. The SFM will coordinate with the team TRs and the server operator as to the time and day of the rescheduled/re-flown match and amend the schedule as required. Scores will be posted as close to the conclusion of each match soon as possible. The Team TR or his designated representative of both Allied and Central teams will meet with a FM on Team Speak at the end of each match to review logs and lodge inquirys. The team TR will poll his team to determine if there are any inquirys. If there are no inquirys are made the match scores will be considered the final scores for the match and posted to the forums. From time to time things will happen during a match, which pilots may question as to the legality of certain actions and events as viewed by them. A team through their designated TR may file such an inquiry following each match while on Team Speak. The team TR will alert the FMs that an inquiry will be made at that time. The team then has 24hrs from the time the TR announced there will be an inquiry till that inquiry must be in the hands of the FMs. It is the TR's responsibility to present as complete and factual documentation as possible when asking for an inquiry. 1) The date and time of the issues in question. 2) The Teams involved in the match. 3) A detailed description of the problem or violation and its potential impact on the match. 4) Witnesses to the infraction and their personal individual and un-collaborated statements. 5) Specific requests for inquiries into specific events. 6) Specific references to the rules involved or governing any potential violations. 7) Specific requests for potential action or penalties as allowed for by the rules. The FMs will then conduct an investigation of the matter. The FM’s will make every effort to resolve any and all legitimate issues in a fair and timely manner, but will also be granted and take whatever time is needed to sort through all the issues and available information to ensure that the fairest possible decision is reached. The FMs decision is final and will be e-mailed to both teams’ TRs. There will be no appeal. The Scorekeeper with amend the scores as required. Until a FM decision is made there will be no forum discussion. The WFVIKII Staff consists of four individuals a Senior Field Marshall (SFM), Field Marshall (FM), Field Marshall Scorekeeper, and Server Operator. These individuals are responsible for the smooth operation of the event, scheduling, refereeing, posting scores, forum moderating, and award presentation. The SFM is responsible for filling these positions with qualified individuals at all times.